The fact that the Western Balkans is being increasingly prioritised on the European agenda is no longer sufficient To achieve real progress in EU integration, the Western Balkan countries need a clearly defined plan that includes a concrete timeframe for all six countries, writes Ilhan Kyuchyuk. Ilhan Kyuchyuk is a Bulgarian MEP from the Group of the Alliance of Liberals and Democrats for Europe (ALDE). To evaluate the Western Balkans enlargement process and to analyse structural challenges, it is necessary to know and understand the region’s complicated history and look at the bigger picture. The timing of this article is not coincidental. The Bulgarian Council presidency has brought the accession discussion for the Western Balkans back to the centre of the EU’s agenda and it is only logical and part of the larger strategy that the subsequent Romanian, Austrian and Croatian Presidency do their utmost to finish what my country started. Anyone who takes a look at a map of the EU can clearly see there is a gaping hole smack in the middle of the Union, between Italy and Greece. It is a remarkable reminder of one of our greatest defeats as Europeans to date: the war in the Western Balkans, with the horrific toll of civilian victims and ethnic cleansing in the 90s. The European unification process is a political project. It rose from the ashes of the Second World War with the main aim to create peace between European nations, who have been at war for more than 1000 years. Its huge success has been the peace and prosperity it brought to former arch enemies such as France and Germany. Its failure was that it did not prevent the outbreak of the war in the Western Balkans. We had to wait for America to intervene in order to be able to negotiate the later Dayton peace accords which ended the hostilities. The Western Balkans enlargement processes started with the dissolution of the former Yugoslavia and have been interrupted by conflict. The development has been determined by the political concepts that are leading the region with respect to EU integration. The regional political process that has been set in motion has now conditioned and oriented the Western Balkans towards an integration into the existing Euro-Atlantic structures. In full knowledge that the strategic aim is a full EU membership. The process should be more swift and dynamic because it involves the same principles and values that are also closely linked to the regional interests. However, the Western Balkans are currently on very different development levels with respect to their integration into the EU. Countries from the region continue to face both political and economic challenges. In large part, this is due to the inability to resolve all regional confrontations and achieve full political consensus. These challenges could deter the necessary political and economic reforms and the overall process of EU integration. The integration process depends on the ability of the candidate countries to preserve democratic governance, political stability, human rights and have a functioning market economy. It is important to note that EU’s Copenhagen membership criteria are necessary, but we also need a holistic approach to the region. Let us not forget the accession process of the Eastern Balkans in the early 2000s. Neither Romania nor Bulgaria entirely fulfilled all the Copenhagen criteria. But the EU15 decided that we need to compromise and win these important countries on the Black Sea before they fall back into the influence zone of third countries. In retrospect and in light of the current unstable global situation, this was a good decision, to say the least. Bulgaria, as a trusted EU member now, can play a crucial role in easing tensions between the Western Balkan countries by exporting its unique ethnic model, which has been a founding stone of our Euro-Atlantic integration. On that score, the upcoming EU-Western Balkans summit in Sofia in May should produce an honest and objective assessment of progress made by the region’s six countries but also offer them a realistic plan for their path to EU membership. We have not had an EU-Western Balkans summit since June 2003 in Thessaloniki. The lack of an unequivocal commitment to the region was rather discouraging to the countries there. This political pledge has not been fulfilled in the ensuing 15 years and the upcoming summit in Sofia is an opportunity to restart the active EU-Western Balkans dialogue. Like with Bulgaria and Romania before, there is a very real threat of losing these countries into the influence sphere of other extremely active players from outside the region. It is in the deep strategic interest of the EU not to allow that. The new EU enlargement strategy outlined this year is another important step on the long road to accepting the Western Balkans into the European fold. 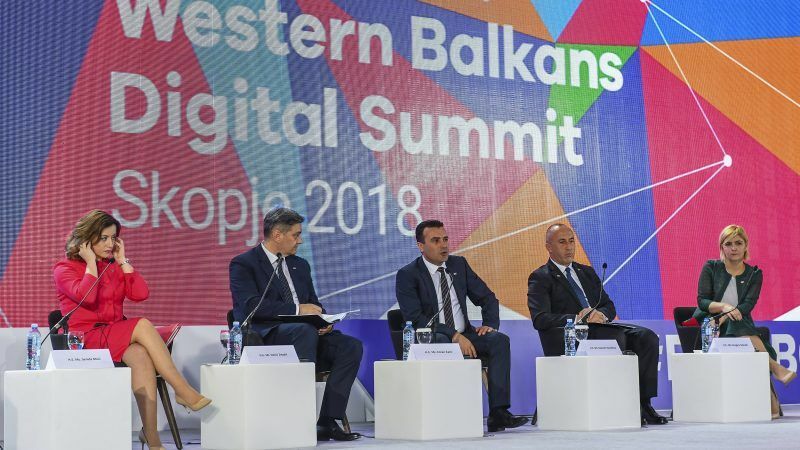 The fact the Western Balkans is being increasingly prioritised on the European agenda, is hardly sufficient, in order to solve the existing problems there. To achieve real progress, countries need a clearly defined plan that includes a concrete timeframe for all six countries, otherwise, the approach of distinguishing between frontrunners and outsiders may breed deeply-seated prejudices in the European community that would be hard and painful to overcome. On the other hand, it is important that the countries of the region continue to implement major reforms, so they can meet the required standards on their path to the EU. The governments must demonstrate resolve and a strong commitment to the enlargement process because a sensibly managed process is in the interest of both the EU and the countries of the Western Balkan. The Western Balkans and the EU have a shared geography, history and present challenges. Today it is our responsibility to accept the Western Balkans into the EU. The historical contradictions in the region, best described in the first Carnegie report “Unfinished Peace”, can only be resolved by means of the full membership of all six countries through a wisely and prudently guided enlargement process. It is time to forgive Serbia for past sins and lead it into our midst. They belong to Europe! Simultaneously, we need Bosnia to forgive all of us for silently watching while their husbands and sons were slaughtered in Srebrenica and elsewhere. That also means measuring different realities with different measures. We should not hit the brakes and restrict ourselves when it comes to the EU enlargement, but rather motivate the current and future member states to work hard for a comprehensive process of mutual benefit.